Subtitle: ARTWORK GONE TO THE DOGS? I found the original posting by De Es Schwertberger a few days ago. View a video about this on Swiss TV. Do watch, it is quite interesting - and while I speak German as my native tongue, I would need a translator for Swiss-German - it's about as foreign to me as Chinese. In the mind of the author, in the sense of my artistic intention, the PLANETARIAN world stands for world unity, world peace and world culture, therefore the name PLANETARIANS. They are not individuals, but essentially have been invented by me as "a group sculpture with a ambassadorial message". The sponsor and owner of these 92 PLANETARIAN has now given them away to a foundation for animal rights and a animal shelter, because he sold the land on which they stood. Homeless, as it were, they found shelter on the grounds of the shelter, but they will soon leave, sold separately, and scattered into the winds. It is over with the community of PLANETARIANS. So that the action of the auction in connexion with the wildlife advertising gets a technical bite, the organizers of the PLANETARIANS auction just renamed them "colorful dogs". Now they serve the interests for them, for animal rights and animal welfare. They do good now, as PLANETARIANS UNDER COVER. I have only now learned by chance of this situation, and am in the process of gathering more information online, after the auction was in progress already for two weeks. Because they are continuously degraded to colorful dogs, and offered for sale well under their material worth, their PLANETARY IDENTITY is swept under the table. also there was only a scant hint at their creator, that it was an Austrian artist named DEES. It should be a matter of course, one would have included me as the creator of the PLANETARIANS into this serious game, or at least by mentioning my name De Es Schwertberger and my website www.dees.at . Interested parties could then inform themselves about my work, which would benefit both me, the auctioneer and the new owners. When designing your own garden, the possibilities are limitless. From small garden gnomes to heavy sculptures - like the Planetarians - anything is possible. Until recently, the Planetarians stood in the Fribourg Môtier on the shores of Lake Murten. Why they had to leave there, and what is up with these figures is shown in the report by Sandra Büchi. How to get your "Colorful Dog"
Which "colorful dog" is your personal favorite? The various price categories give everyone the opportunity to participate in this exciting art auction for animal welfare. 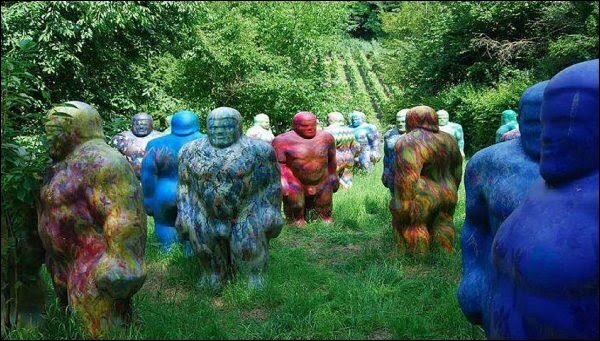 All figures were placed outdoors for years and therefore have different degrees of weather-related markings. Every "Colorful Dog" is therefore unique and carries its age in its own way. Your can buy your "colorful dog" either on this site at a fixed price or bid on ricardo.ch. The 92 "Colorful Dogs" can be reserved by telephone and viewed at the shelter Pfötli in Winkel. Phone Shelter Pfötli: +41 (0) 44 864 44 00, Monday to Friday, 13.30 - 17.00 hr. http://www.ricardo.ch/ (Auction Key word "animal welfare"). By the end of June each week will bring up new Colorful Dogs, and on July 9th 2010 there will be a great final event at the shelter Pfötli. The net proceeds of the action will benefit each half of the TIR and the Foundation of Animal Rescue & Shelter Pfötli. Support us by purchasing a colorful dog and give it a home in your garden, shop or office building! Thank you very much and good luck bidding! SO BID ALONG AND HELP THE PLANETARIANS REGAIN THEIR DIGNITY! It is all well and good, this auction. Art proves to be useful and do good. I am all for that. To completely disregard the intentions of the Artist and not even bothering to make an effort to contact him (guessing well that he would not necessarily play along), I find this utterly wrong. I just now learned by chance about these unplanetarian proceedings. One could have as a minimum mentioned the artistic value, the creator and the planetarian message, before pulling them so rudely from their Superman pedestal into the animal world. The renaming of the PLANETARIANS is vandalism. the MONA LISA remains MONA LISA and is not a sweet pussycat. My artist name is De Es Schwertberger. You can find out plenty about me on the web.